Discussion in 'Show off' started by PsyVision, Mar 16, 2016. 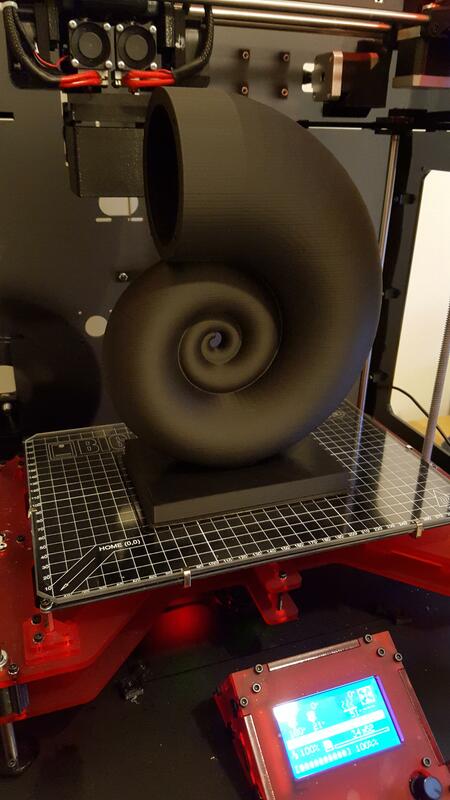 Aside from the OpenRC F1 car that I am printing I am working on a pair of Nautilus Shell Speaker. 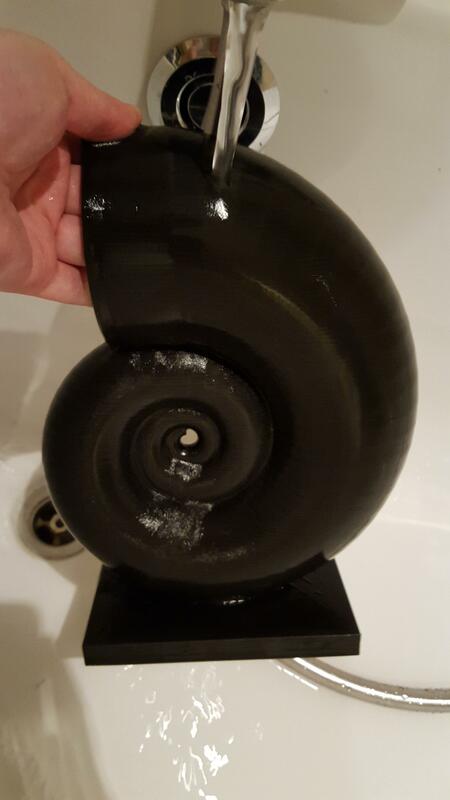 As a fan of the Bowers & Wilkins Nautilus speakers the minute I saw these on Thingiverse I knew I had to print them. Not only that, but the designer, Alex Mordue put them together specifically for printing on his BigBox. 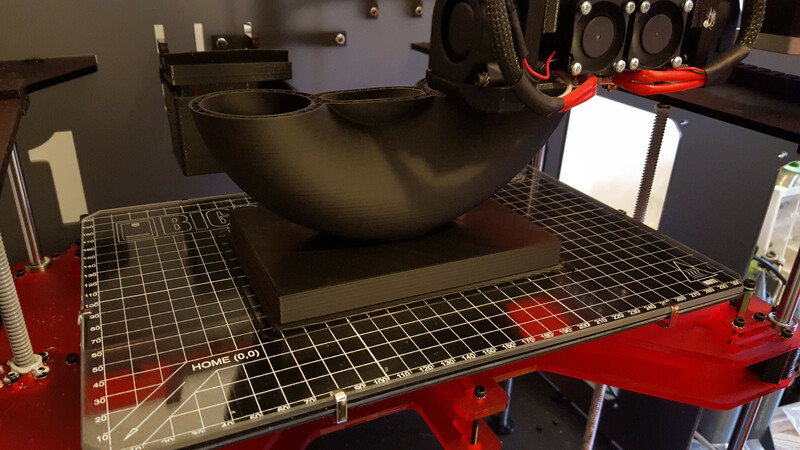 The above was printed with a 0.4mm nozzle at 0.2mm layer height at 40mm/s in E3D Everyday PLA. My plans are to sand the speakers and apply a primer, a further sanding and primer if required and then spraying with black car paint followed by a gloss lacquer. They will be fitted with 4" drivers and connected to a Class-T amplifier. I will post more photos as I print the second speaker cabinet, process them and then wire them up. Mike Kelly, Skinny Kid and Madeinoz67 like this. Any information yet on the enclosure volume? I'll attempt to fill it with water and then report back. That is good. If it leaks it need to be sealed. A decent 3D-tool should allow you to isolate the inner volume using some editing and boolean operators, then you can get the enclosed volume very precisely. I assume the speaker does not need any damping material? Nevertheless, it might be beneficial for the acoustic quality to put it in an outer box and fill that with quartz sand. There is just one good measure to minimize wall oscillations: Mass. If that is not enough, get more mass. I assume this is a closed speaker so recommended is to fill it at least 75 to 85%. Nevertheless, it might be beneficial for the acoustic quality to put it in an outer box and fill that with quartz sand. Stuffing that shell volume (now I know why slicers are asking for the shell count!) with damping material could become a bit of a challenge. Print a damping structure? Ok... But how to retain the shape? sorry, as a non-native english-speaker, I am not quite sure what you mean by this question. 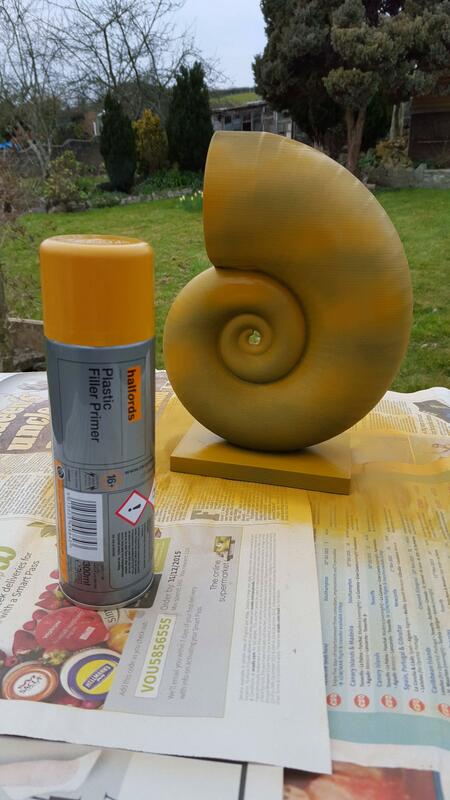 If you aim at keeping the shell shape visible - hmm, yep, that would get lost in a box. But do you want to look at your speakers or listen to them? If both, build one dummy set for the eyes..
Rectangular loudspeakers create a natural resonant panel that needs careful management to avoid resonance but with tapered horn loaded loudspeakers with circular cross section there is little or no resonance provided the structure is stiff and this looks very stiff. Any filled filament should provide reasonable resonance control. Filling the inter wall gap may improve things. This is just the first sand in 320 grit. I will give it another sand and then a sand in 1200 grit. Then primer and a further sand. Mike Kelly and Skinny Kid like this. Looks good. while you rinse, measure the volume. Since it is a closed speaker it do not have to be extremely precise. Just so I can put that volume in and se how the speaker will react. And what response you can expect. Filling a multi-threaded shell with water without enclosing any air bubbles may end in some contortionist's exercises . Getting the water out again is a step simpler. Or use Archimedes' concept, measuring the displacement. Subtract the shell's wall. Or do it empirically based on what I suggested above. 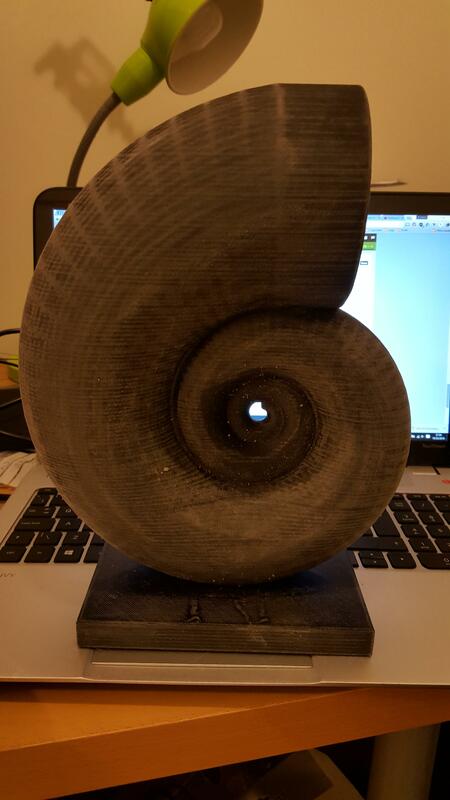 You could also integrate the cross sectional area over the length of the deconvoluted shell. I think the usual simulation programs like boxsim etc. are not very precise for non-square housings. When I designed an optical membrane position feedback for a speaker some 45 years ago (not unsimilar to the IR sensor for the bed zeroing), I was surprised that the speaker had no resonances any more - without any filling - and that was a box. Disabling the feedback loop led to the expectable non-linearities. Could you not use CAD. You could subtract the model from a block and get a fairly accurate idea of volume that way? I've started spraying some primer on the cabinet. Aiming to print the second one this Friday/Saturday. Yes the camo vibe is cool. I need to work out how to fill some holes where there was too much overhang. Some epoxy resin or something maybe? I'm not sure what's best to use. Also about to set the second one printing!